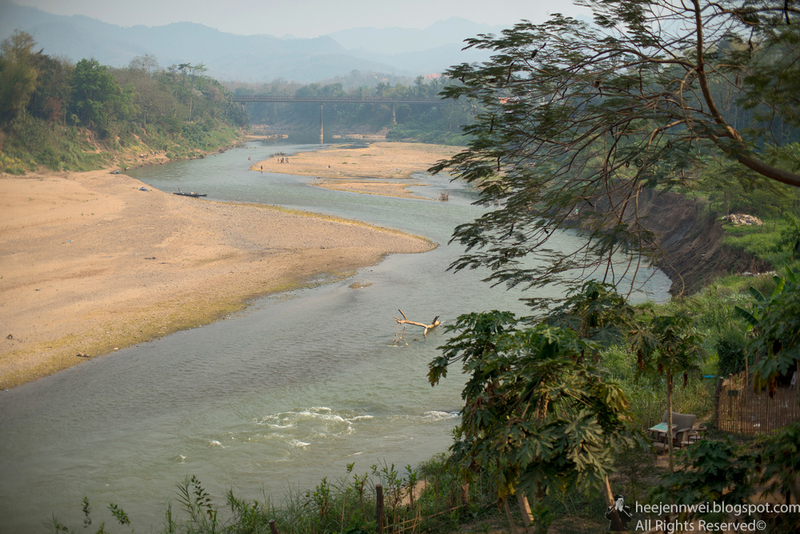 Within the Chronicles' Frame: Laos, Please Don't Rush! Years of war and communist regime hinder travellers from crossing its borders, only until mid 90s, the government reversed their stance on tourism. 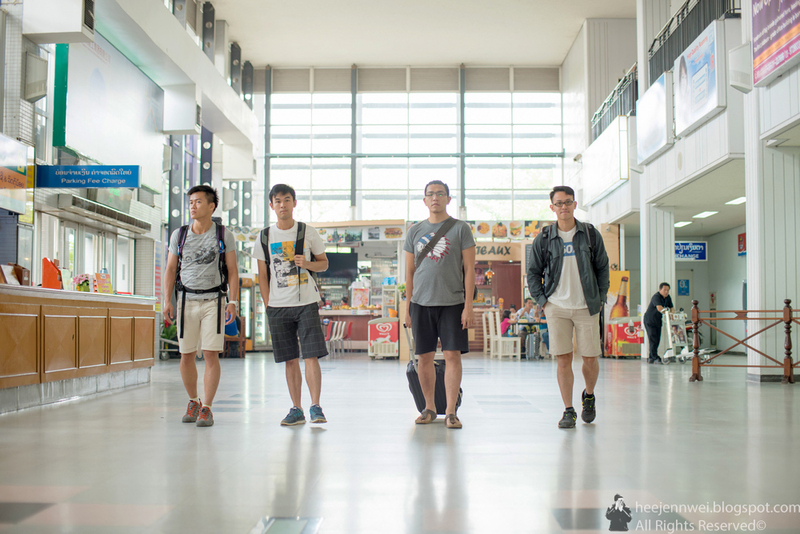 It immediately emerged as a craze destination for backpackers, despite the flocking tourists, it's still far less commercial than its neighboring countries, the laid back vibes. A landlocked country borders with Myanmar, Thailand, Cambodia, Vietnam and China, it is the least developed country in SEA. Cuisine of Southeast Asia meets French. 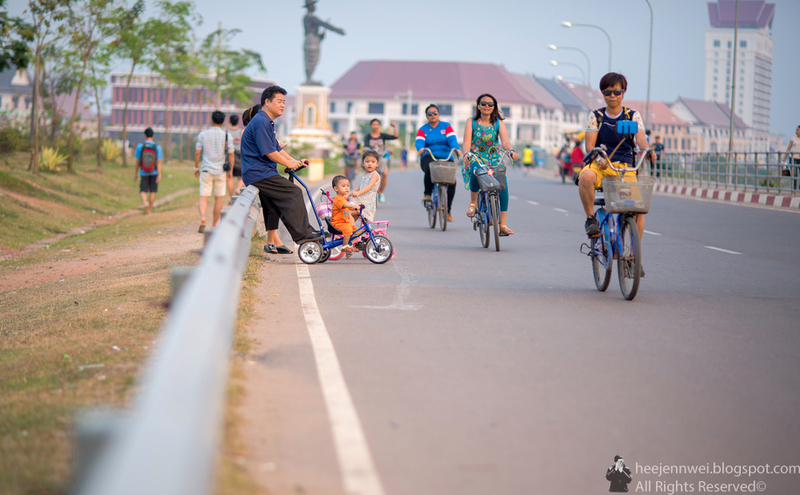 Off city limits, surrounded by dusty roads, children frolicking by the streets, tiny stores decorated in its most vintage way, entire families on motorbikes, thatched huts contrasting new modern developments. 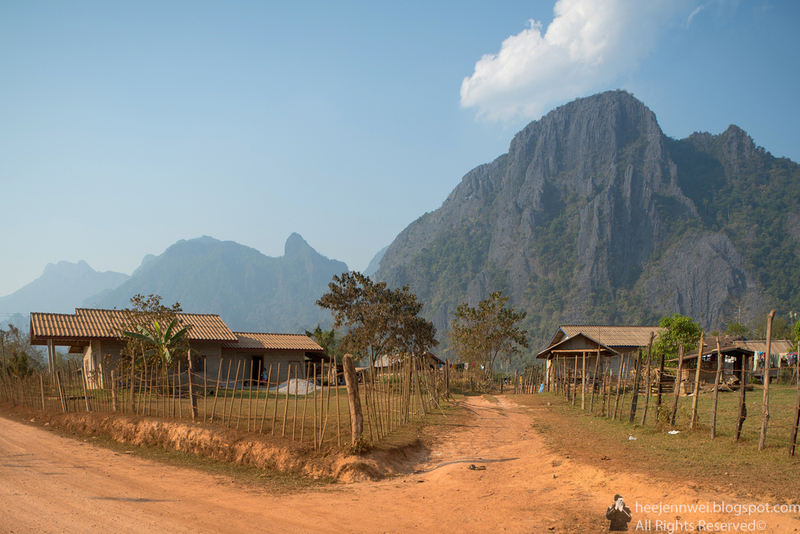 Modest homes and small Hmong villages in Vang Vieng outskirt. 3. Bicycles are your best friends! 5. Long sleeve and pants for entering temples- Respect their culture! 7. Do not trust Google Map travel duration! 8. Do not trust Wikitravel suggestion to used Thai Baht and USD for transaction, profound stupidity! 9. 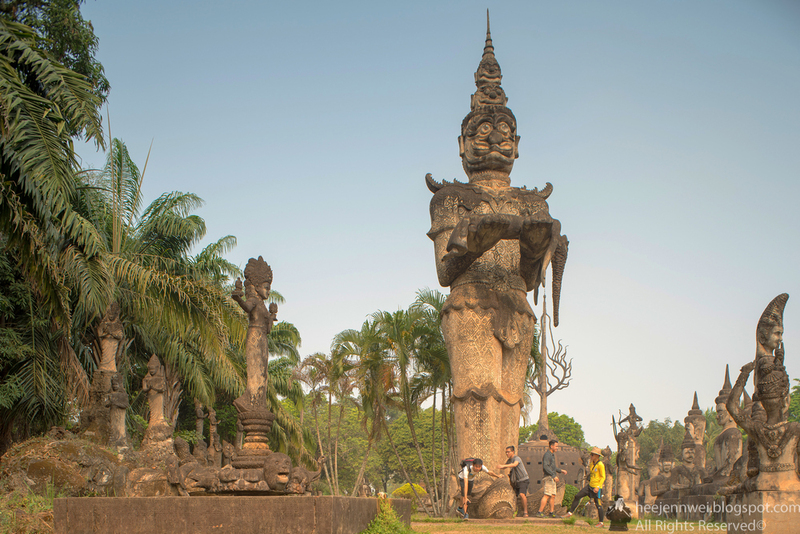 At Laos, please don't rush! We hop onto a cab head over to Vang Vieng immediately after we've touch down Vientiane Airport (Wattay), an unappealing 4 hours potholes dirt road drive from Vientiane to Vang Vieng. 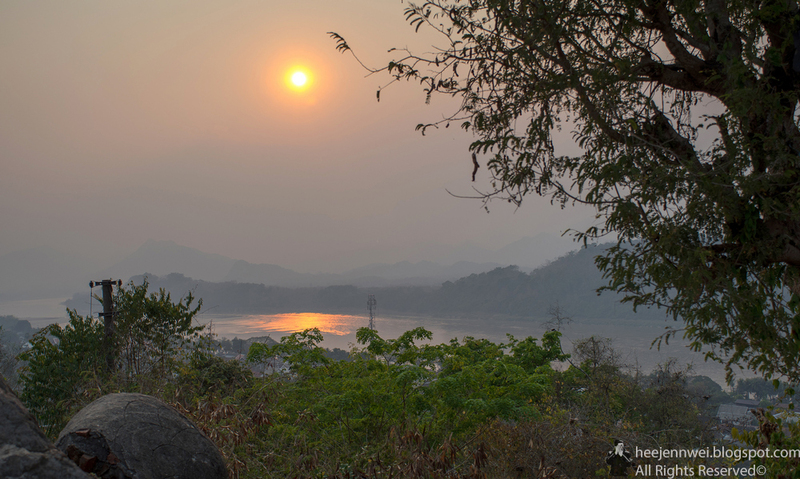 This is probably the most implausible party town, laying deep in the central Laos, the once tranquil farming village turn into a backpackers mayhem, most for the party but we, thankful to its natural beauty along with towering limestone peaks, dense with caves, lagoons and forests. You may come here for tubing but stay for the stunning riverside scenery, beautiful mountaintop and lovely limestone crags. 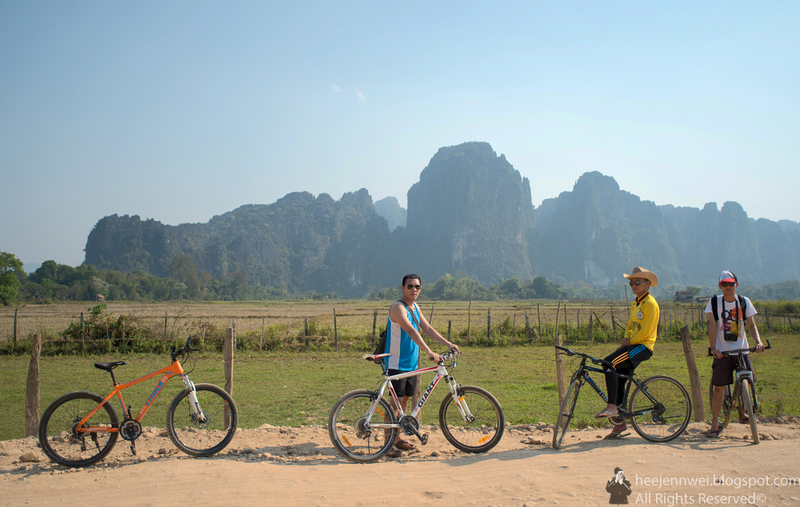 Hire a bicycle and explore Vang Vieng- it may just be the most rewarding experience you have on your trip. 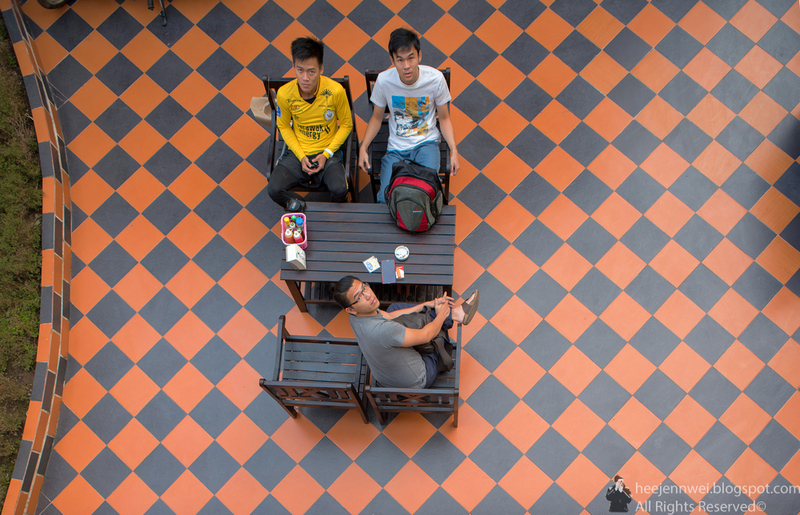 Not to forget slack off at any cafe, order a beer and enjoy the endless reruns of Friends and Family Guys. 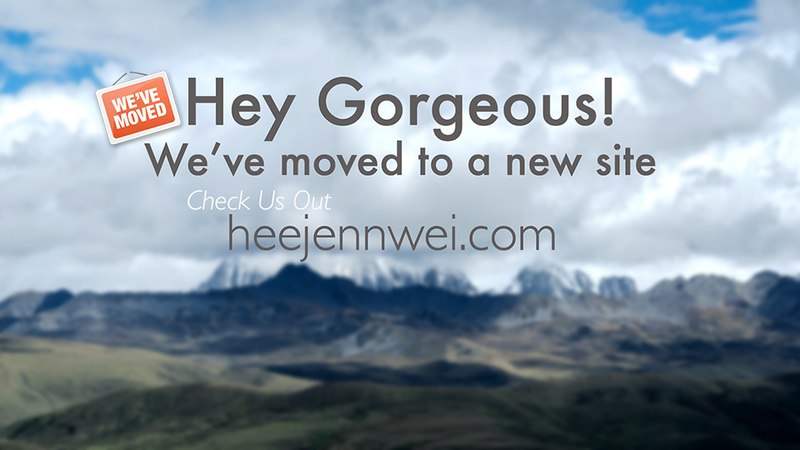 Absolutely surreal! 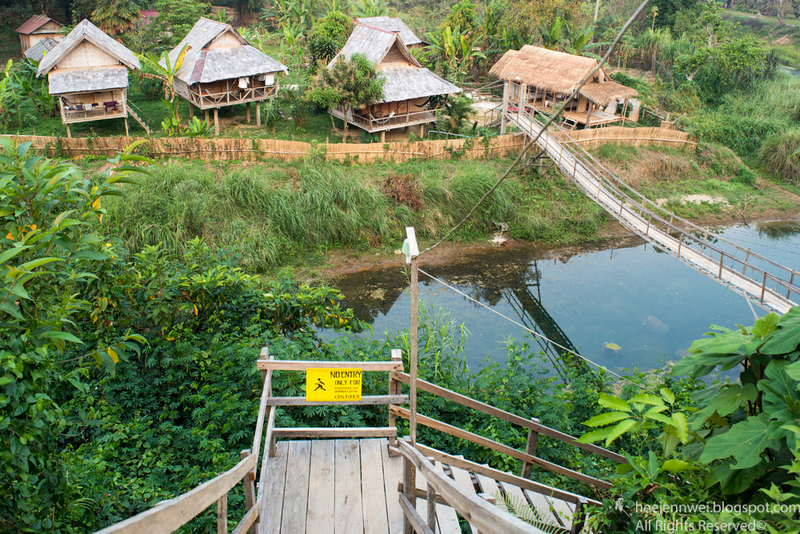 We ought to cross a wooden bridge to the bamboo charm of Champa Lao Bungalows. Probably exhibit the best authentic experience, a beautifully appointed Laos style in bamboo charm of Champa Lao Bungalows, arranged around lush tropical garden courtyard, incredible cosy area with hammocks overlooking beautiful greenery, 5 minutes walk from the city center. 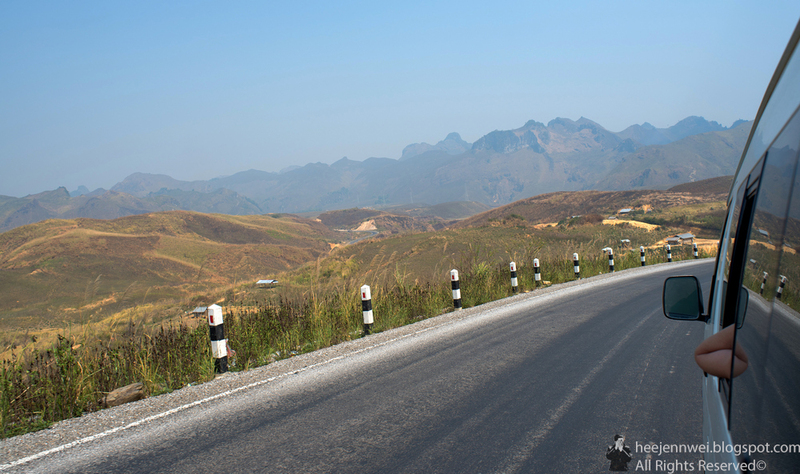 7km ride from Vang Vieng city to Blue Lagoon, riding along potholes, pit-run gravel, it turns out to be one of the most memorable experience on our trip. The water was in a stunningly shade of blue from limestone around. Stopped for photo with the majestic limestone crags. 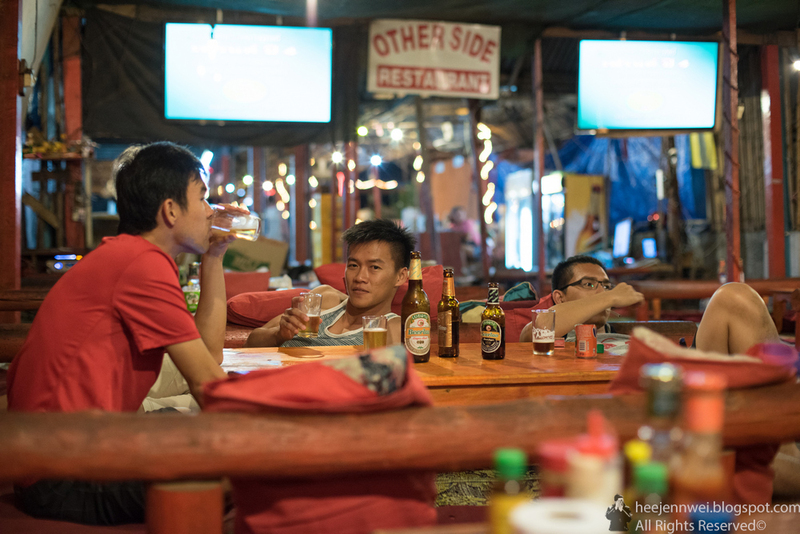 Vang Vieng town- abundance of good food with quiet beer and night activities. Slack off at cafe with beer and endless Friends and Family Guy reruns. It was nice waken up by rooster with this view from our bungalow. 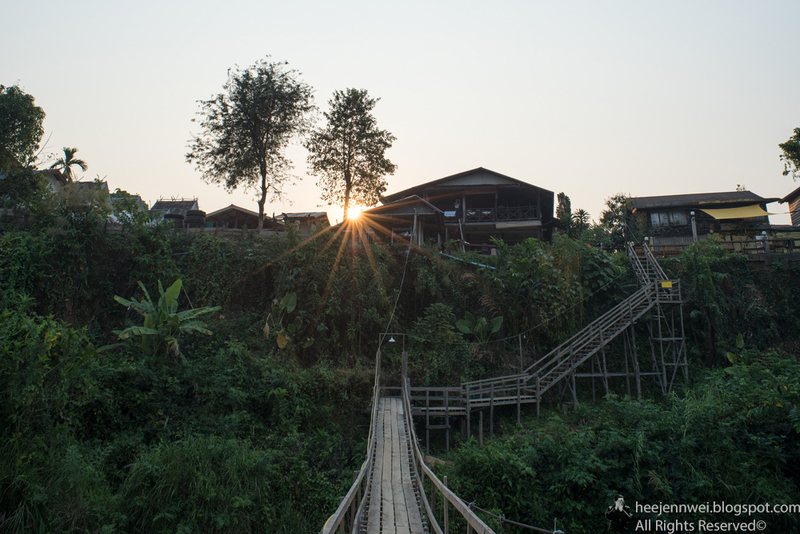 Sunrise view from Champa Lao Bungalows. 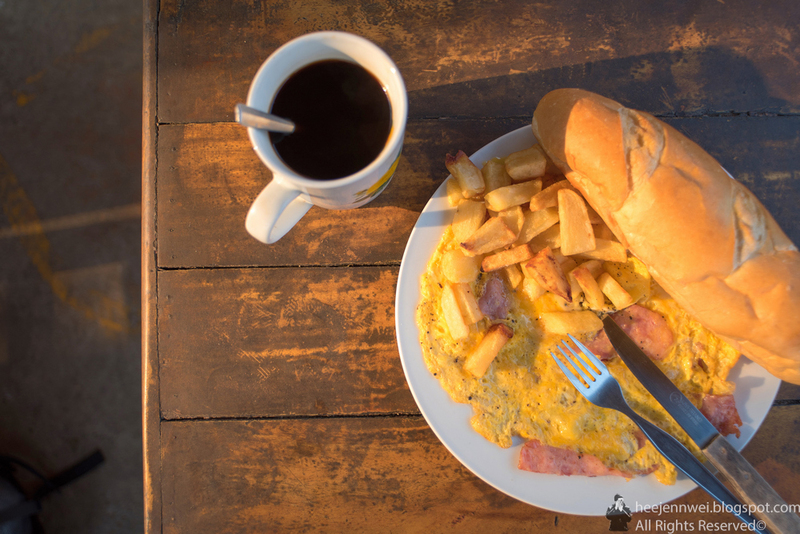 Western breakfast at the Belgian cafe for another adventure of cliff drives. Six hours of jostling around on a minivan, veering close to the edge of cliff, and the driver's bathroom breaks, well off the aforementioned cliff. 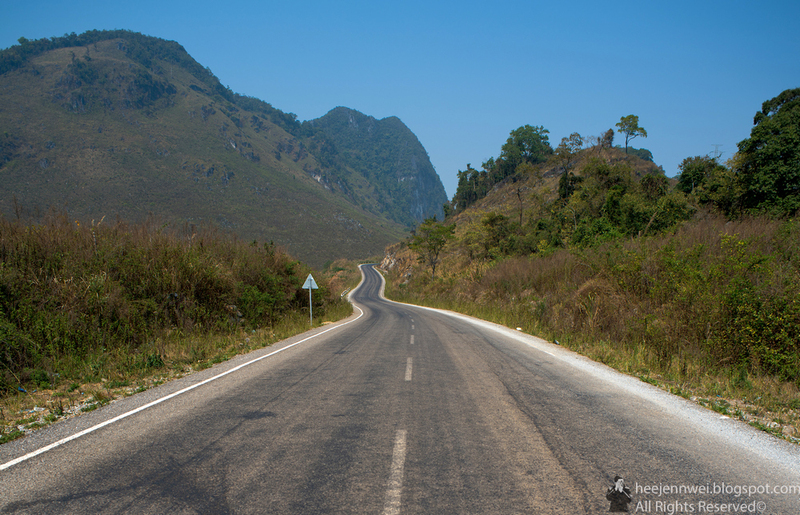 Driving through some of the most beautiful mountain ranges i've ever seen, worth it, this is probably one of the must do thing in Laos! For most of the way it lined up with wooden huts and market stalls, women selling surplus produce of farms, children play sands in dust at roadside, chasing plump puppies. Mountain range from Vang Vieng to Luang Prabang. 6 hours through the twists and turns of mountain roads. 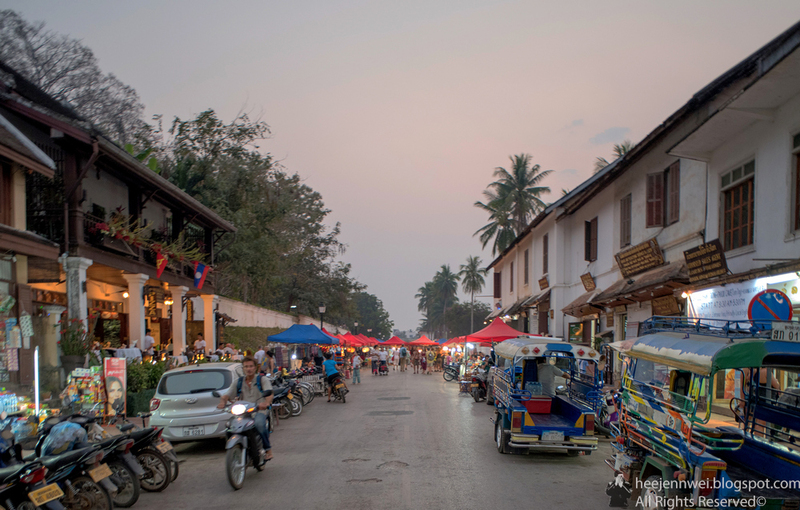 We reached Luang Prabang at noon, quaint, beautiful, romantic of French colonial architecture, delicate temples, drenching at the confluence of of Mekong river and Nam Khan river. 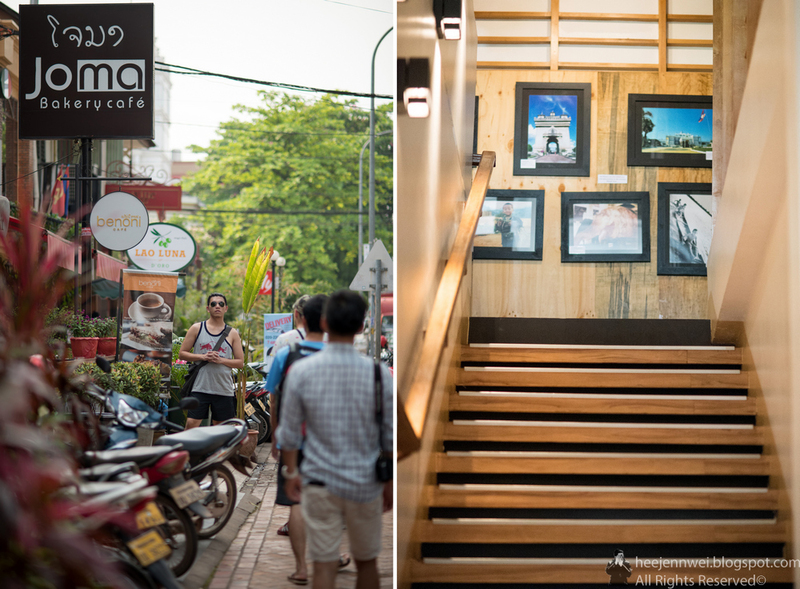 First day, filled ourselves at JoMa bakery for hi-tea, explore historic temples, hike onto the Mount Phousi, shop at the foothill night market. Buddha in storage of Wat Xieng Thong, alongside the cremation chariot of Lao king with large naga heads at front and urn at back. 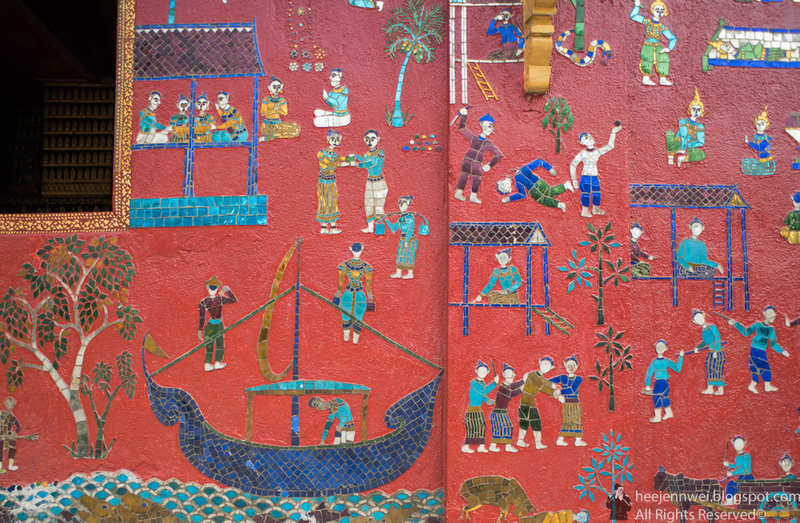 A small chapel at the side of Wat Xieng Thong with tree of life mosaic in colored glass on a dark red background, the craft shows worshipers and Buddha images in pastoral setting with trees, plants, and animal, the mosaic was crafted in 1960s by Lao craftsmen. 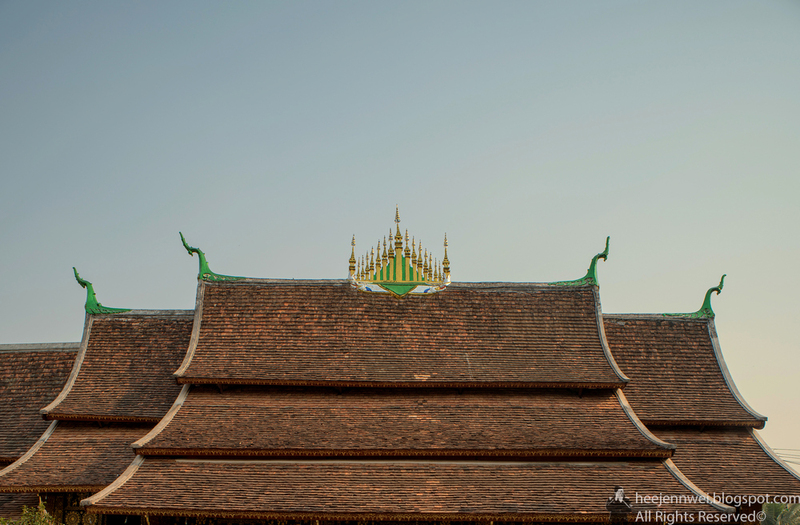 Dok So Fa- a decorative element in the center of the main roof. 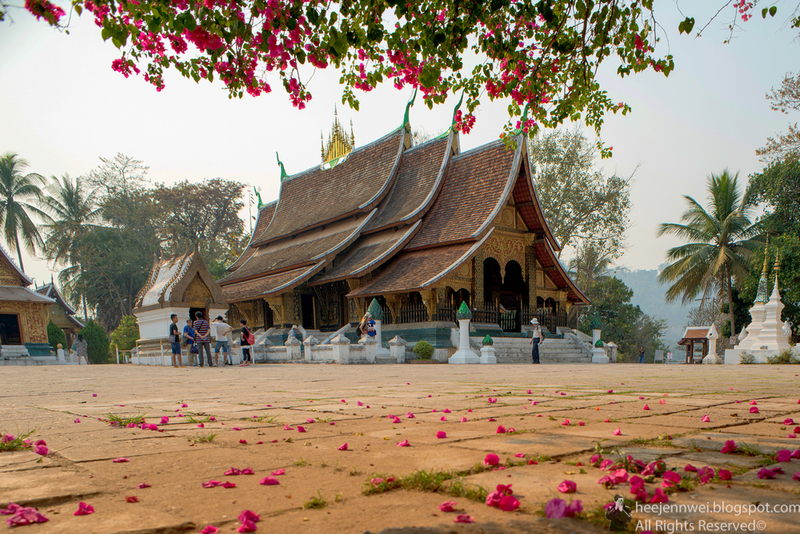 The tree of Life- Wat Xieng Thong was remodeled in 1960s, becoming a splendid temple we see today, roof was repaired, entrance gilded, both interior and exterior covered with black, glossy lacquer and decorative figures, and symbols in gold leaf. Colonial French buildings sitting at the foothill of Mount Phousi. A kilometer long night market across the French colonial buildings. Lot of interesting items on display, but some are not cheap, you probably need to bargain your way out but don't expect a huge discount. 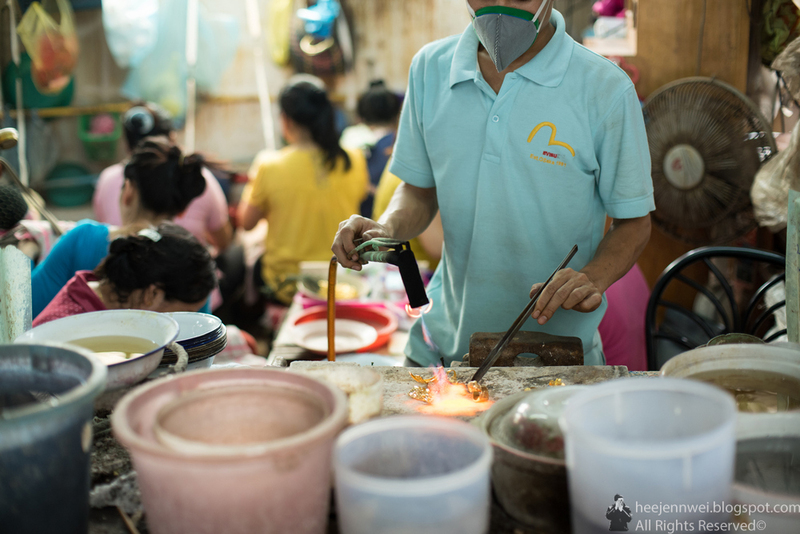 Located along Sisavangvong Road from Royal Palace Museum, Here's something not to be missed in this charming city, it offers a selection of extensive handicraft made by local ethnic groups. 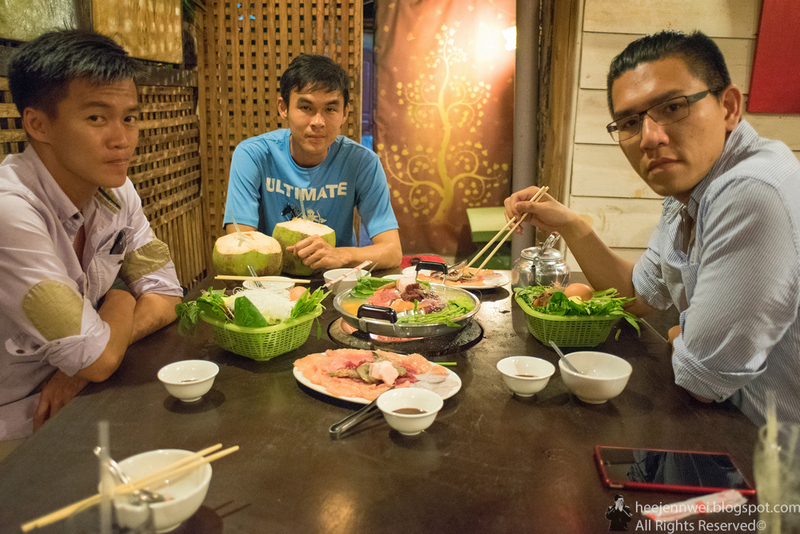 Sabaidee Barbeque Restaurant, along Nam Khan river, is a fun spot try to cook your own meal, Lao style. 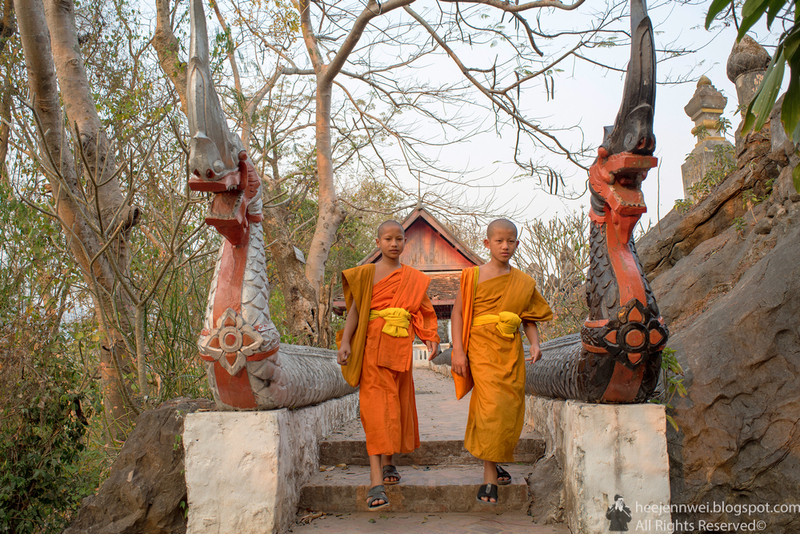 The UNESCO world heritage city of Luang Prabang says it all, this is the perfect place to see one of the most sacred Lao traditions, the Buddhist Alms Giving Ceremony. 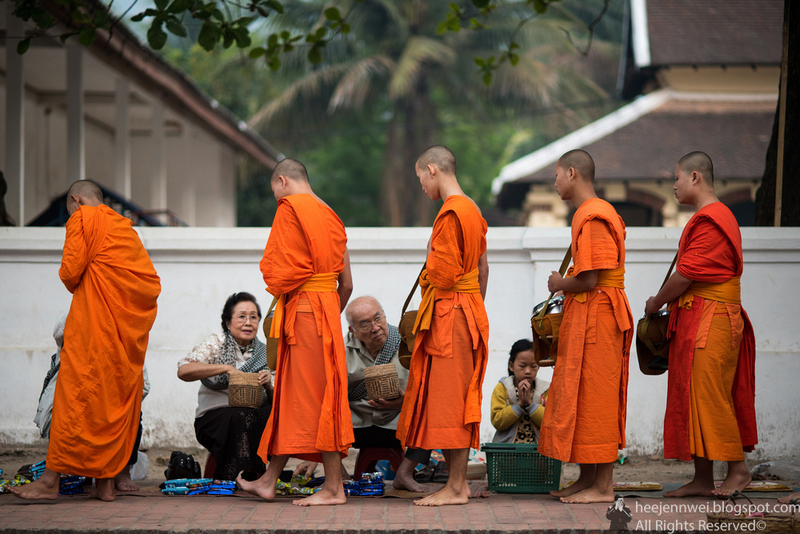 Alms is giving daily as sun rises, begin on the main street of Luang Prabang before spreading out to all sides of streets. 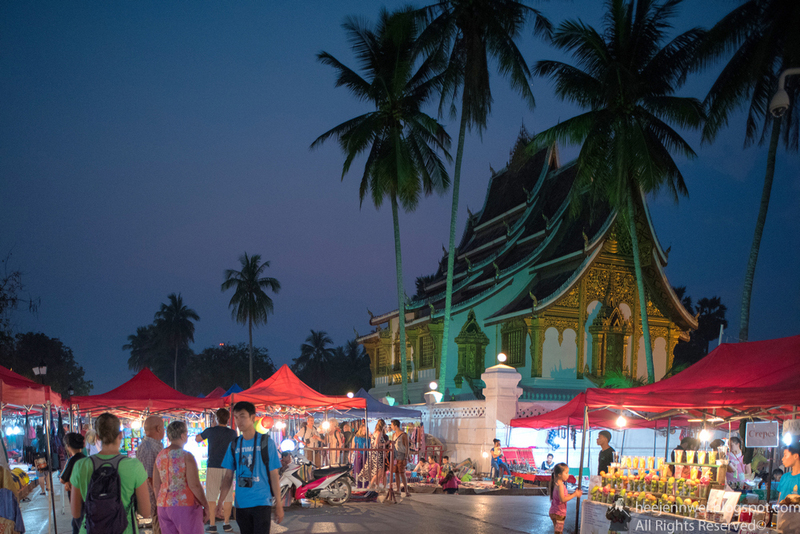 Tourists can buy their own offerings in advance and arrive with plenty of time to spare as it's offensive to disrupt the ceremony once it has commenced. It's a peaceful and spiritual ceremony to ancient Lao tradition, please do not use camera flashes on monks!!! It will bring you bad luck and curse for the rest of your life. 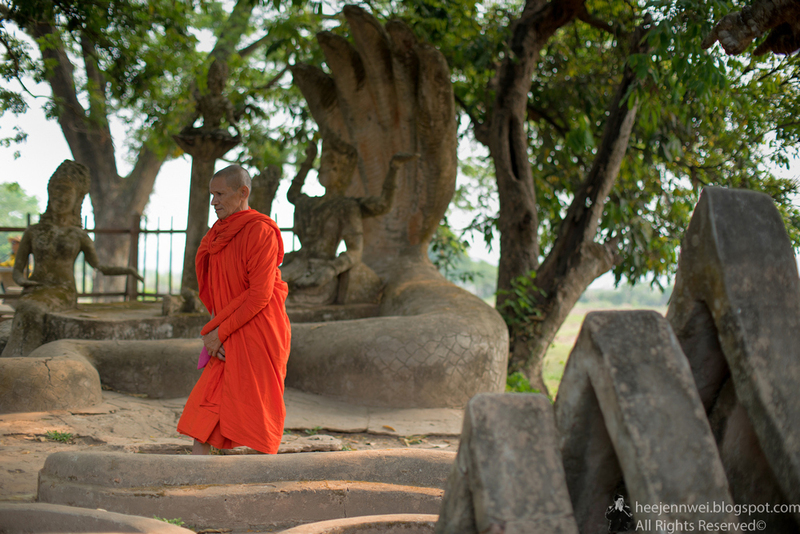 Around 200 Buddhist monks depart from their various temples to gather their daily meal. 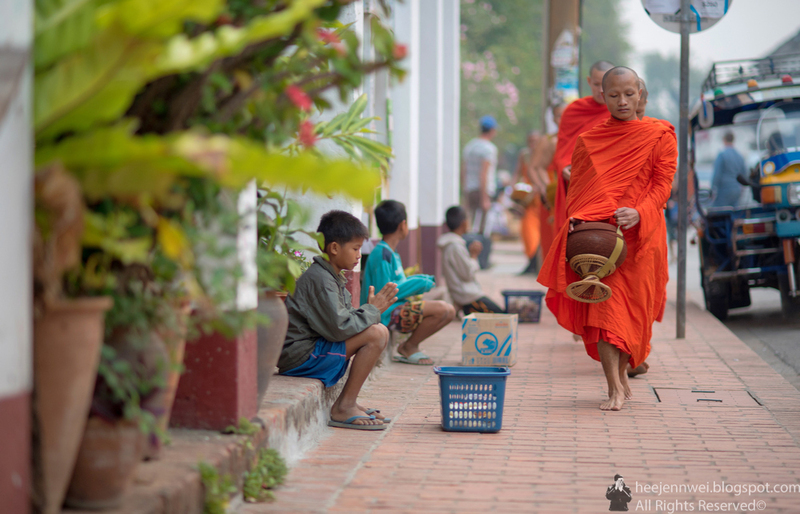 Although the main purpose is for the locals to give alms to monks, you will also notice there are children with basket in the hope that the monks will share some of their alms so that they can take food back to their family. 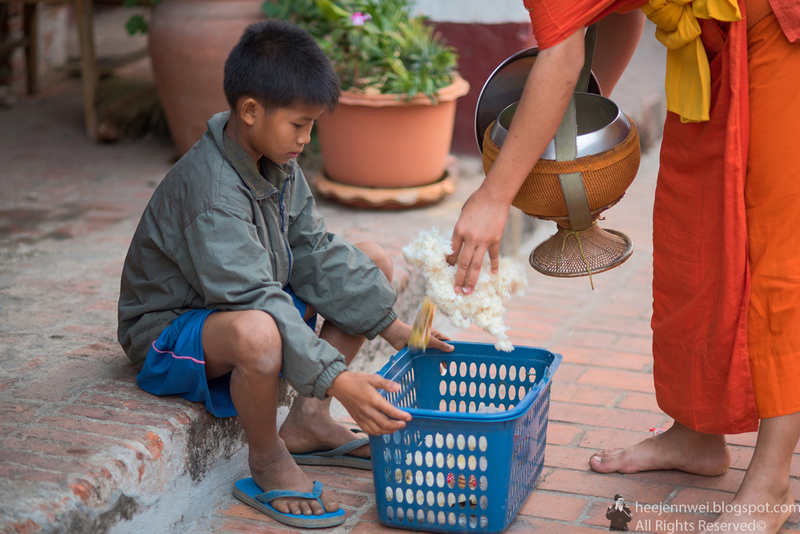 Monks in their daily routine, cleaning their stupa. 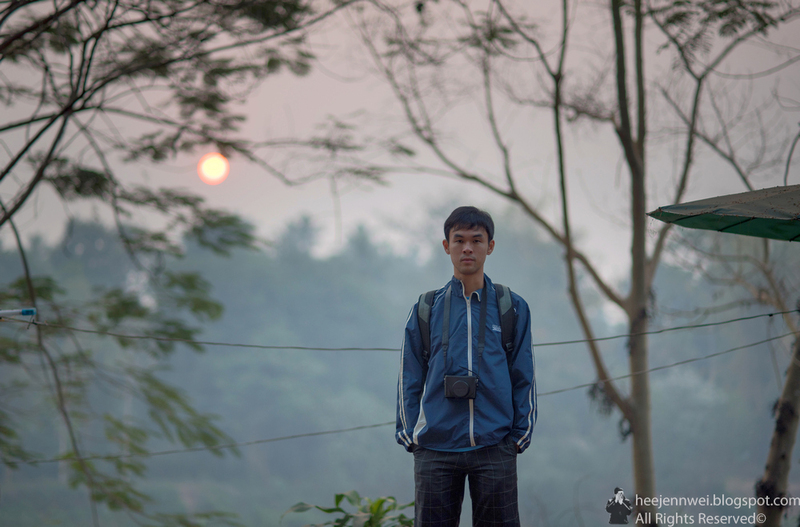 The tranquil event happens in an extremely fast pace, make sure you got to the main before it broke of dawn, this was taken after alms giving ceremony, the sun is barely awakes. Gorging ourselves a big breakfast at an Aussie bar. 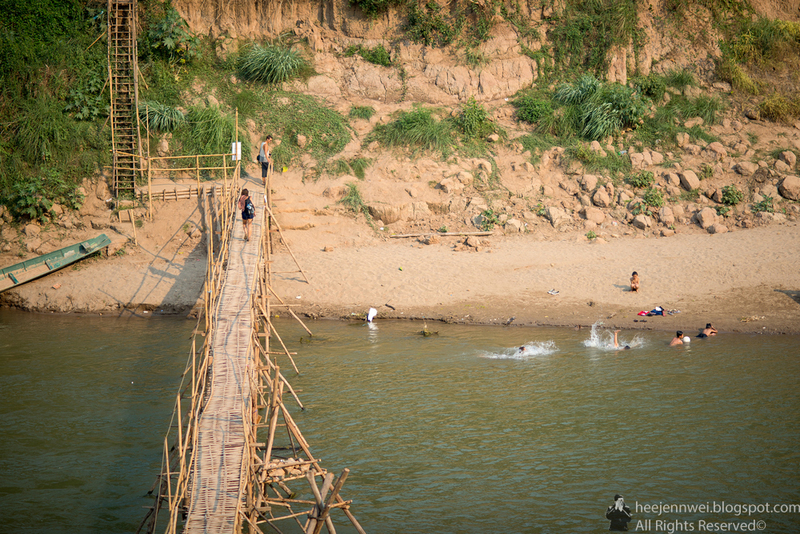 KUANG SI WATERFALL- LUANG PRABANG TOWN & 11 HOURS ON THE BUS! 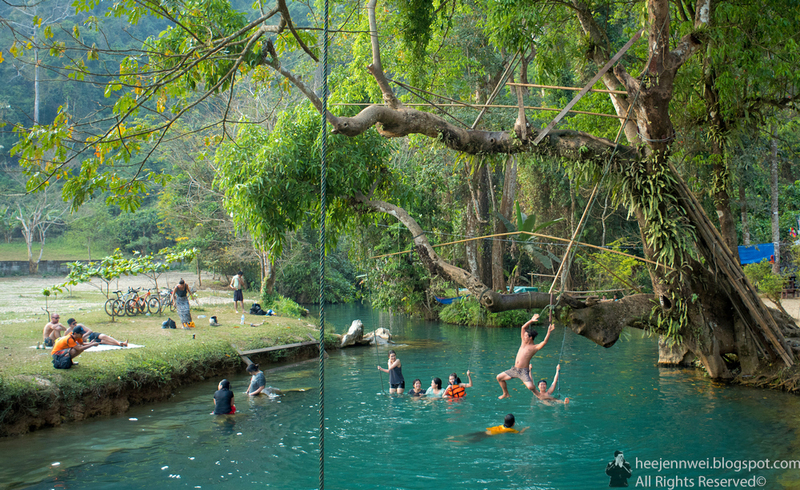 Crispy clean, and cold water cascades gently over limestone formations, gathers into layers of stunning turquoise pools, a rewarding journey just an hour from Luang Prabang town. Halfway between the park entrance and waterfall is the Asiatic Black Bear rescue centre, houses a couple of animals rescued from poachers and traffickers. A beautiful way to spend the day, we booked a mini van from travel agency next to our hotel,Villa Merry Laos III. The rush of tumbling waters gushing downhill. 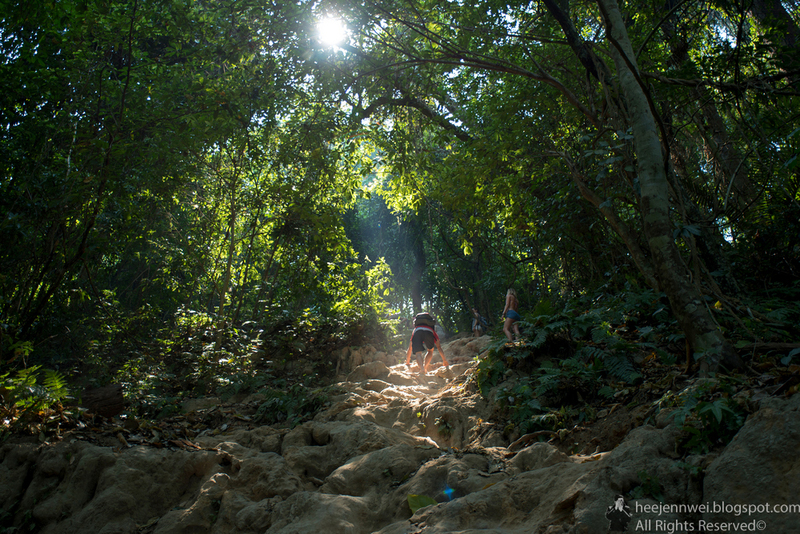 There's also trails where allow you to climb all the way up to the top where you can see the stream feeding into the falls and enjoy some natural pools. Trails can get slippery and steep but bearable. 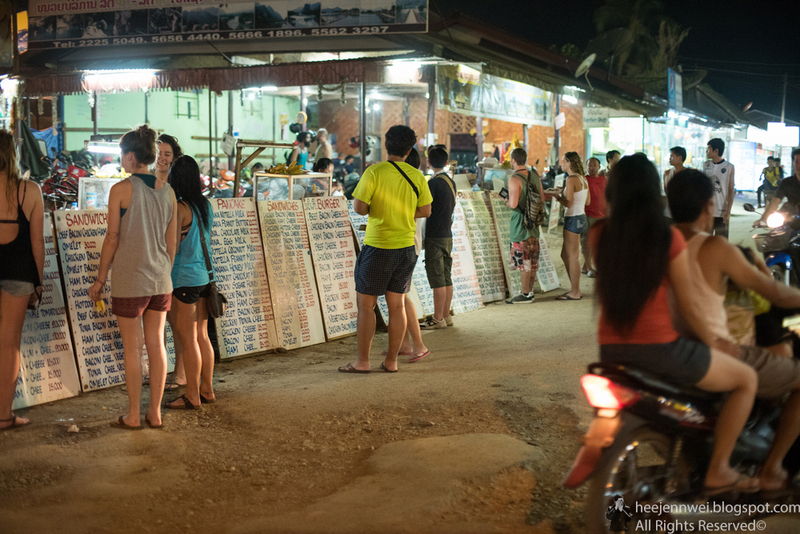 Back to the Luang Prabang town while waiting for our 8pm sleeper bus to Vientiane. 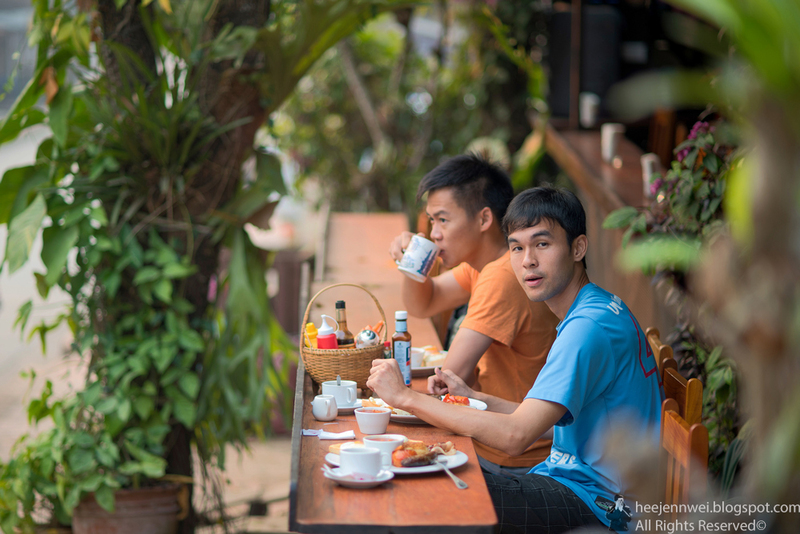 Now coffee is definitely something worth a try, it comes with rich and strong aroma, mixed with sweet condensed or evaporated milk, there's pretty much no better way to spend a afternoon in a laid back Laos and explore the town while waiting. 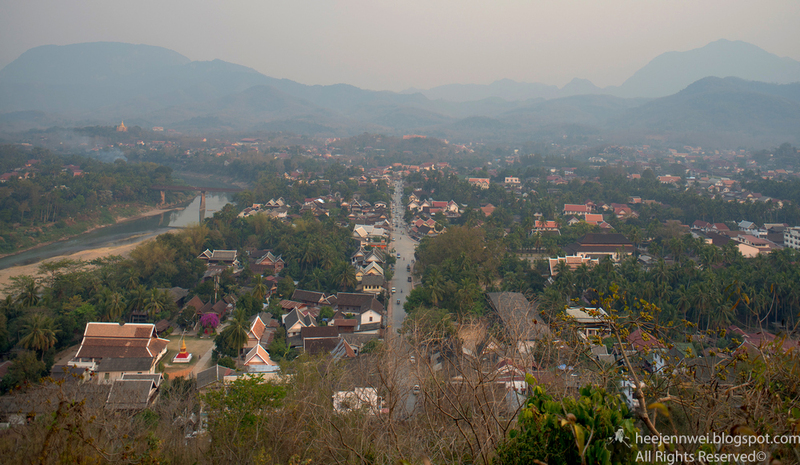 Luang Prabang to Vientiane will take you 11 hours on a dry season, probably longer travel time in wet season. We won't want a day went wasted, assured, we got our sleeper bus ticket from the same travel agency next to our hotel. If you heard about the insecurity on the road, i think the only thing you should be worried about is the quality of your bus, make sure it's a sleeper bus for the long ride, of course don't expect cosy and comfy. 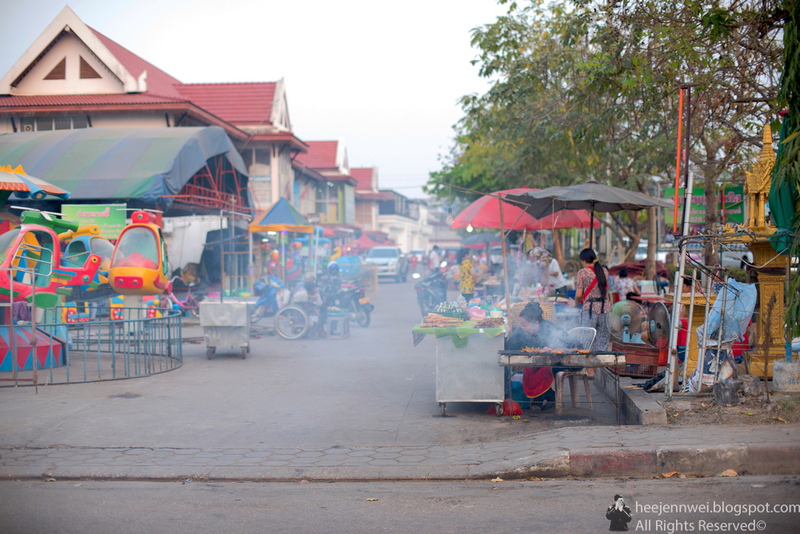 11 hours bus ride from Luang Prabang to Vientiane, and a tuk-tuk ride from Vientiane bus station to town center. 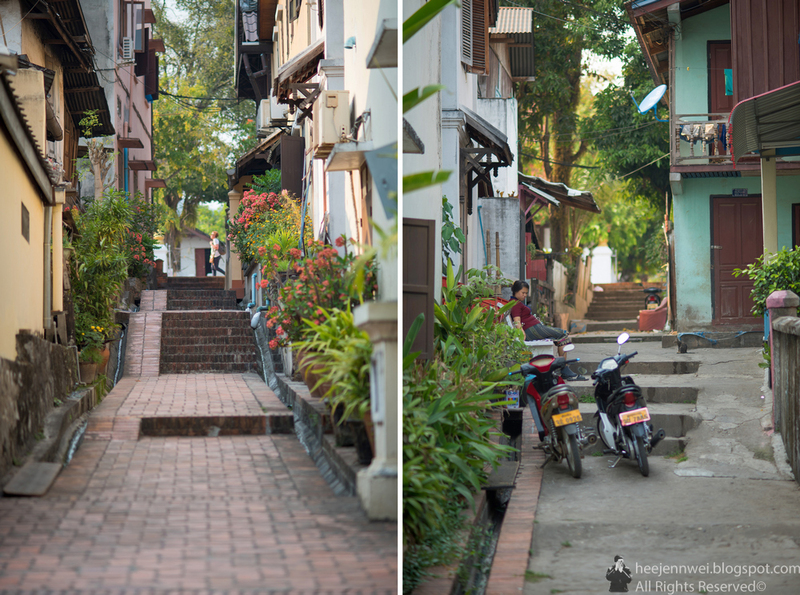 This is a place long way from buzzing cities like Bangkok or Siem Reap, probably quite likely to be one of the smallest capital cities you'll ever visit. 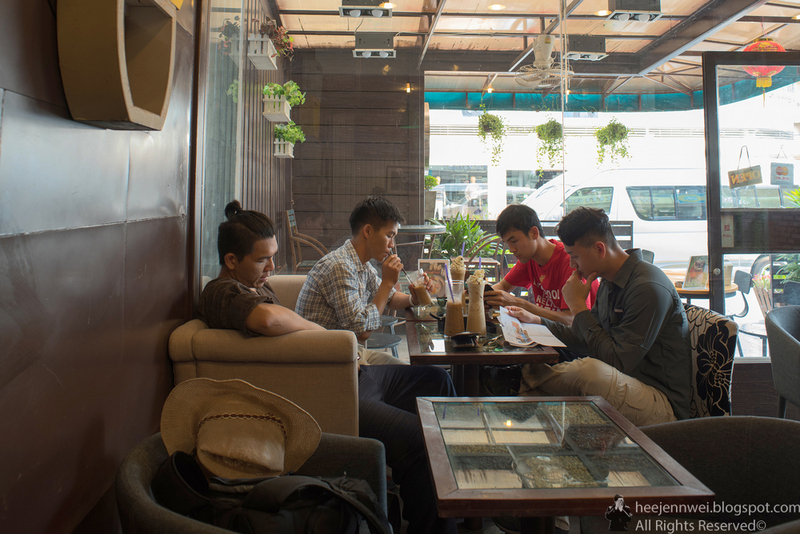 You should start your day with a Lao Coffee, on ice, local style and brace yourself for an intense dose of caffeine and sweetness. We decided to rubber tramp, but of course you should pedal your way around. 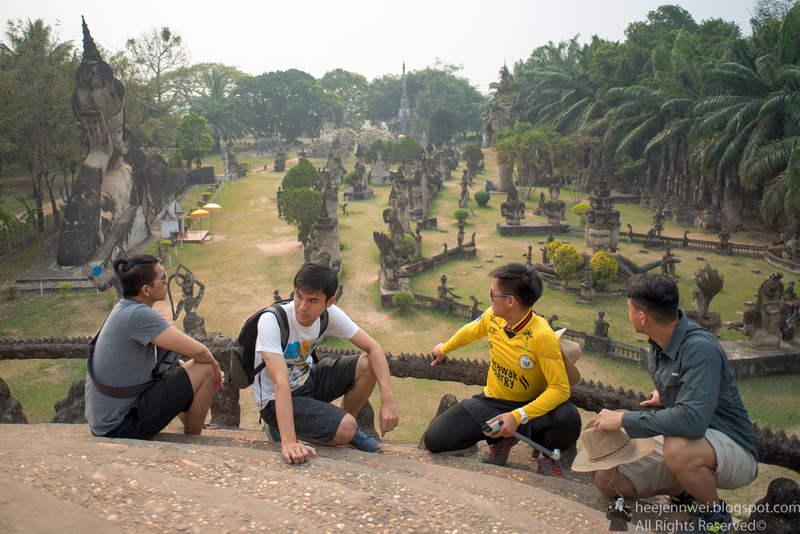 That Dam- Patuxai- Pha That Luang- Wat Si Saket, that's how you should do it, with long sleeves and long pants as well. There are many raw cultural experience that command your attention; temple Wat Si Saket stand chief among them, the oldest Buddhist temple in Vientiane, it was build in Thai structure, thus escape the fate of being burn down or destroy during the Siamese raid in 1828. 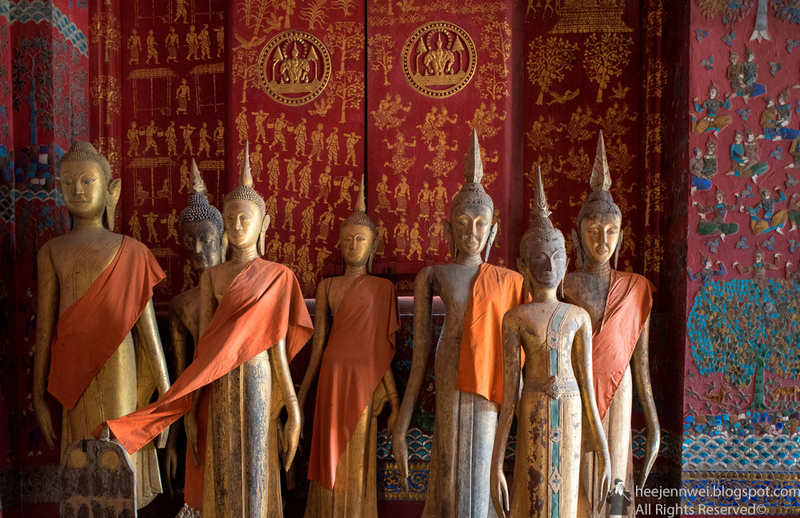 In the inner cloister, you will find many Buddha idols made of stone, wood, silver and bronze, photography is not allowed inside Wat Si Saket cloister. 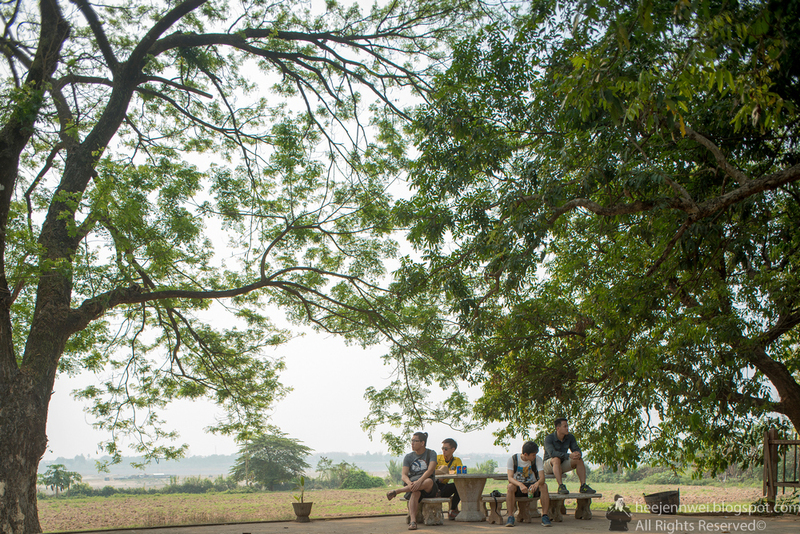 If you have enough time to spare, be sure to check out the Lao National Museum, where it detailed the history of this tiny landlocked nation carved from French Indochina. 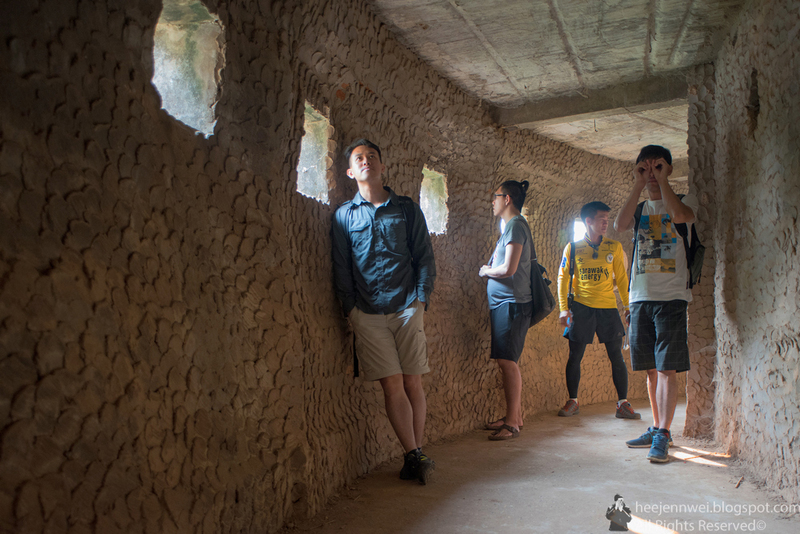 Artifacts include jars from the Plain of Jars, as well as war remnants from the struggles against Siamese, French and Americans, also the notorious Ho Bandits! Lao Coffee made in European style with a side of pastry at one of those Vientiane's French cafe. 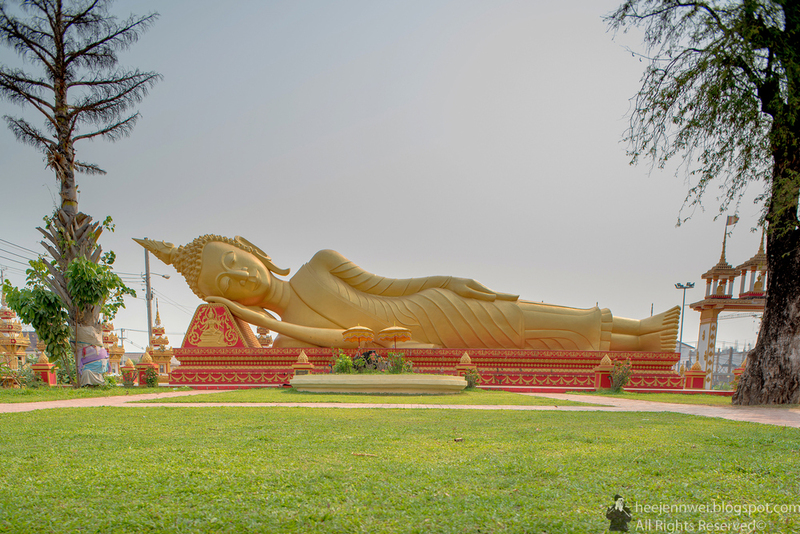 Reclining Buddha of the Great Sacred Stupa (Pha That Luang). 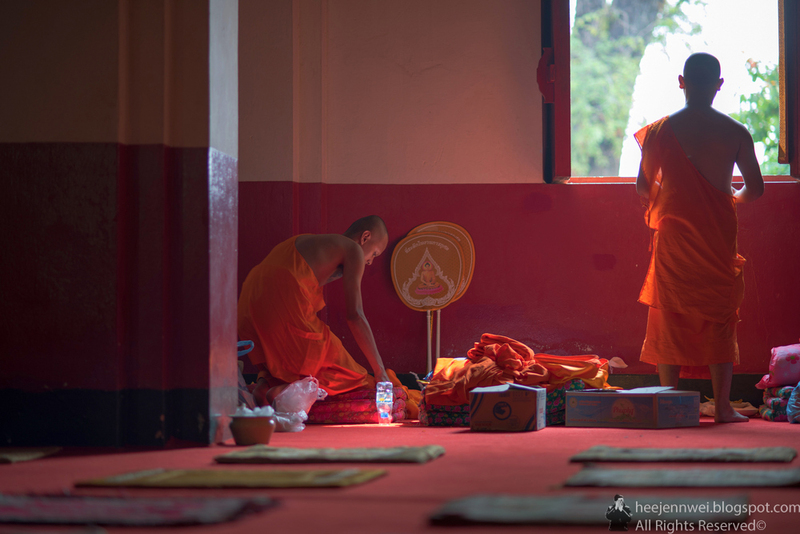 Inside the resting area of monk, preparing for Alms Giving Ceremony. 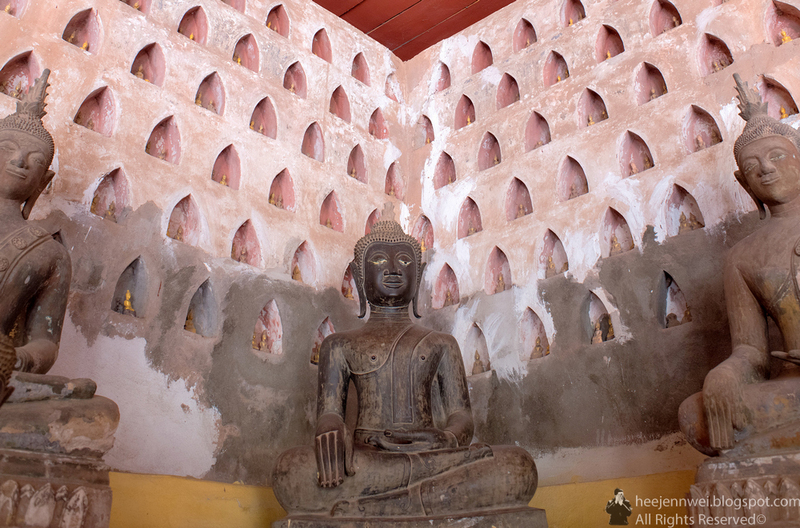 Stone craved sitting Buddha of Pha That Luang. And yes! 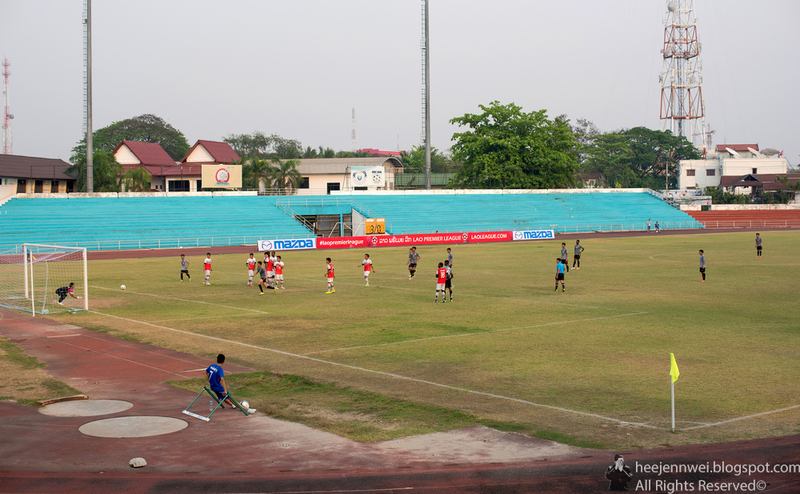 Some football actions at Chao Anouvong National Stadium. 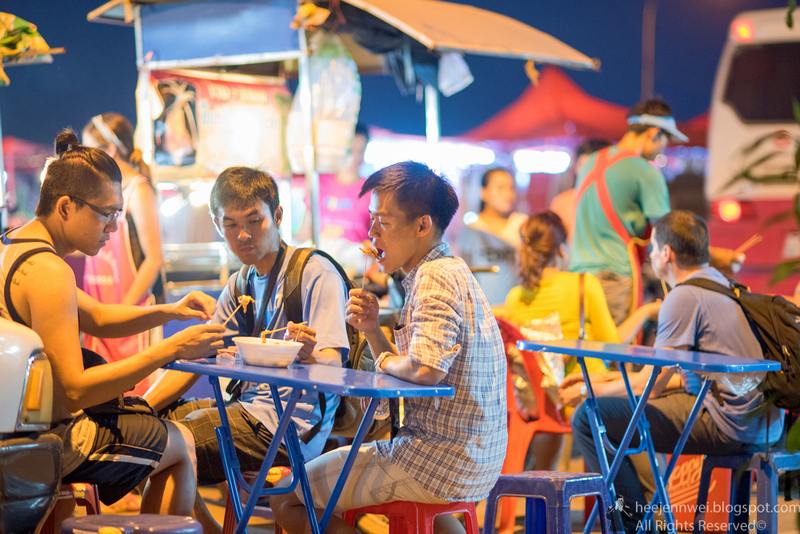 Vangthong evening food market is definitely the place for some local dinner, it right outside of Chao Anouyang National Stadium, it samples the best of everyday Laotian food that is authentic, delicious and amazing value. You have every right to worry about sanitary but it is such a popular local eating spot and the ingredient is always fresh. 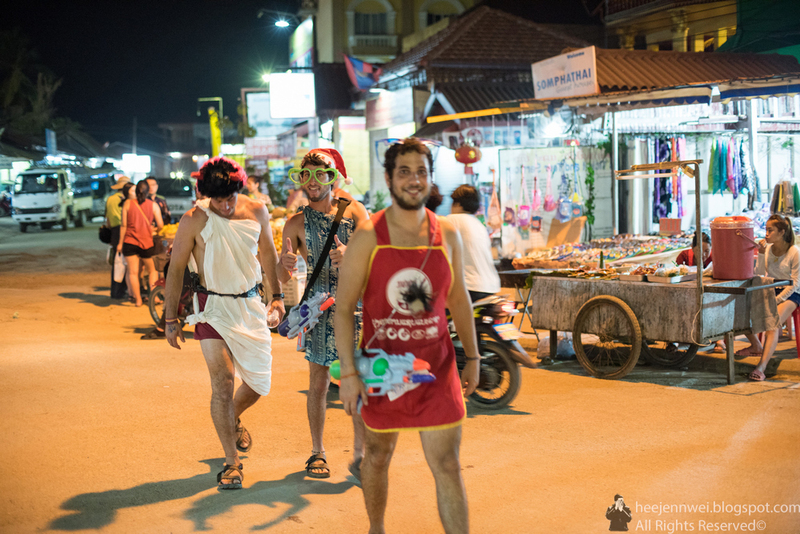 The best way to experience Vangthong is simply stroll from one end to another, buy some small quantities of various snacks and foods. 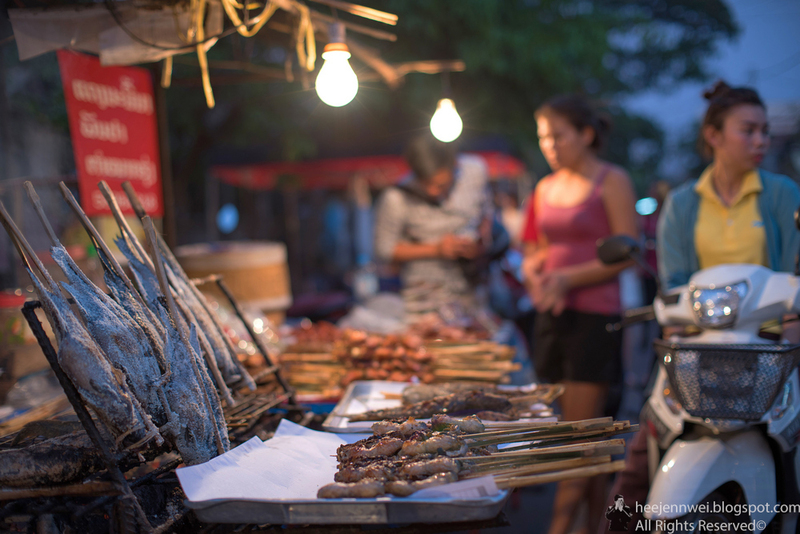 One of the most common food to try Bla Kan Sung- Grilled river fish and Laos sausage. 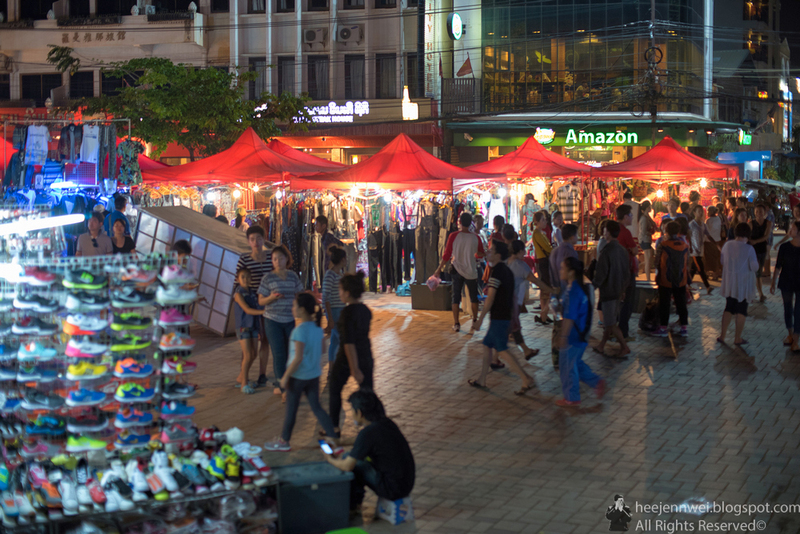 Stroll along Chao Anou Road, you will find your way at the Mekong Riverside night market, this is a market aimed primarily for tourists with all manner of merchandises that make great souvenier. Breakfast at the hotel, Vientiane Star Hotel. Inside the pumpkin-like sculpture, entering through the demon's mouth. Climb up three stories that represent Hell, Earth and Heaven. Talat Sao Morning Market and Shopping Mall, it splits into 2 areas, the one and only air-conditioned shopping mall, and the cavernous morning market with mass-produced t-shirts, trinkets and souvenirs. 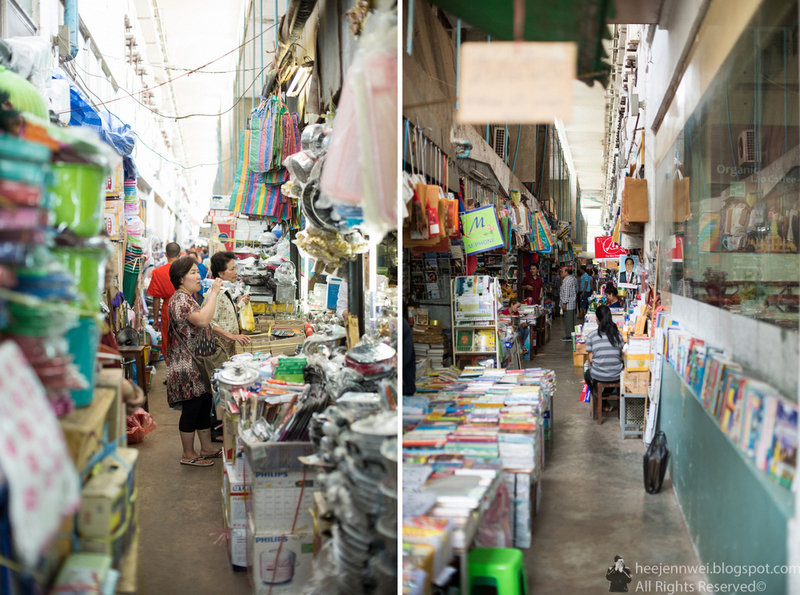 A genuine experience, the market might be disoriented but the walkways are tiled and clean. The labyrinth of alley ways stock a mishmash of stacked high products. Goldsmith at the morning market. Yet again, another caffeine fix. 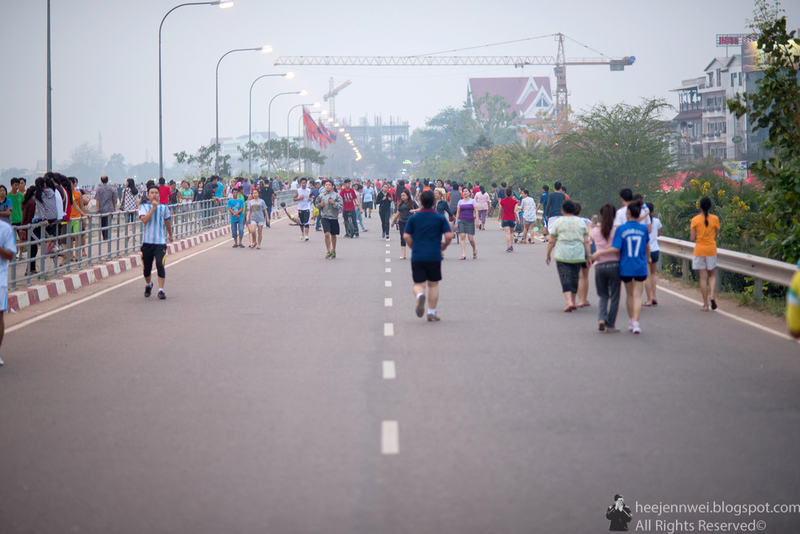 The whole riverside area come alive in the evening, joggers, cyclists, badminton players, the whole exercise class taking advantage of the cooling breezes and stunning backdrop of sun lazily sinking into the Mekong river. 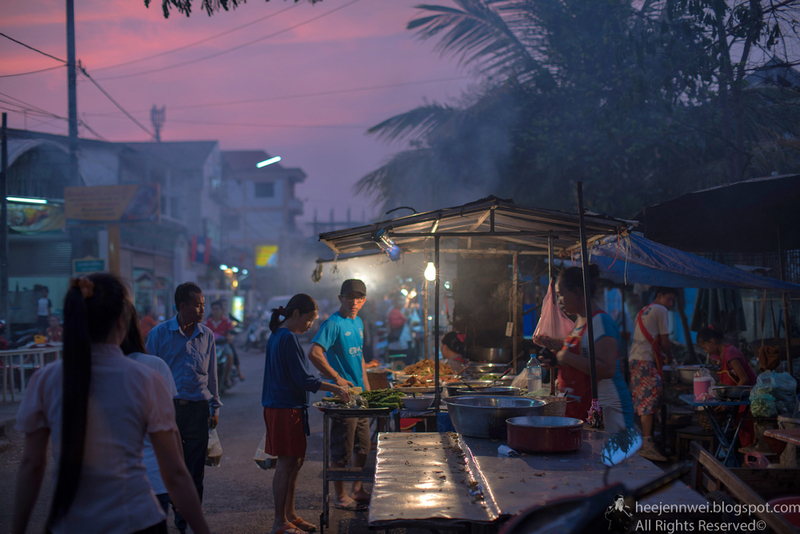 Small food stalls emerge along the wide river bank selling barbecue, sticky rice, and other local foods. 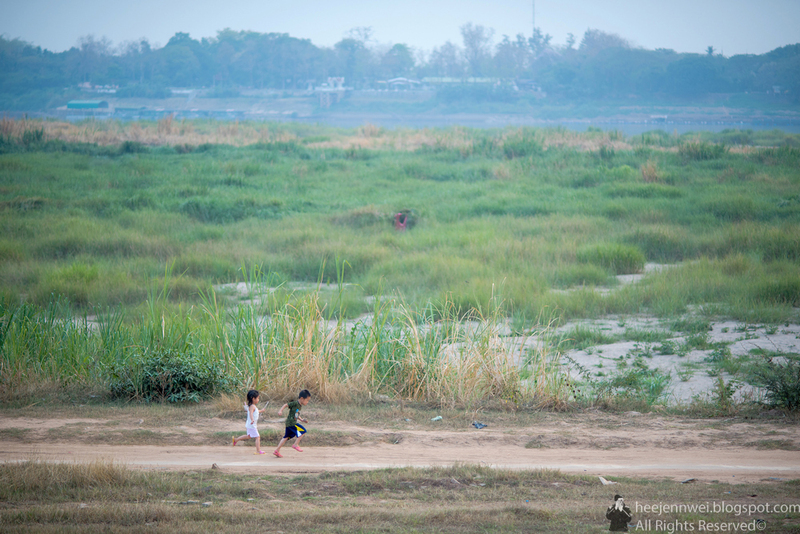 One of the highway lane shuts down every evening for the access of Mekong river bank. The wide spread of meadows and sands. 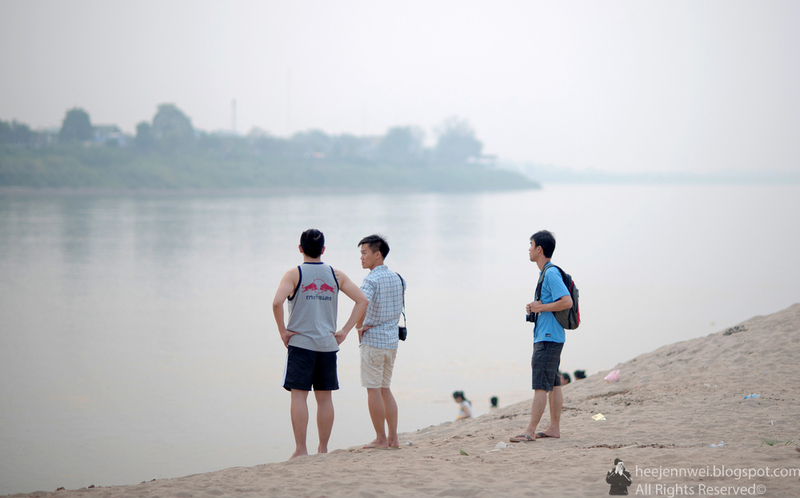 At the edge of Laos' Mekong riverbank overlooking Thailand, Nong Khai province. 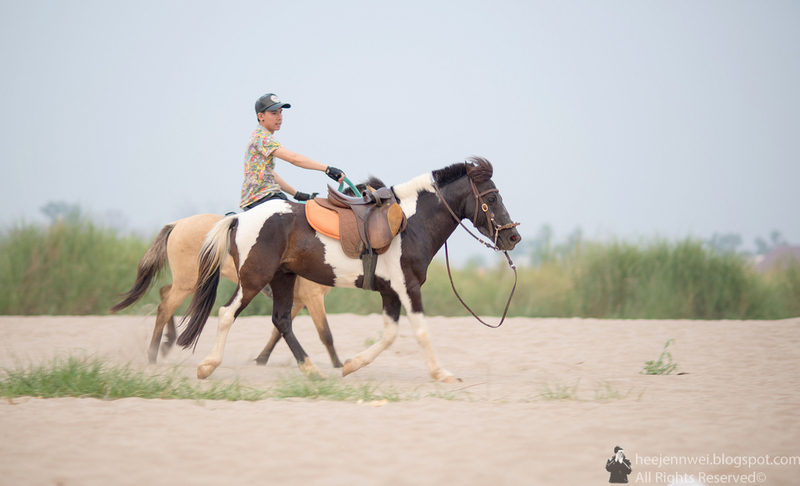 And yes, horse riding adventure on Mekong riverbank. Probably the whole class of Vientiane people are out here. 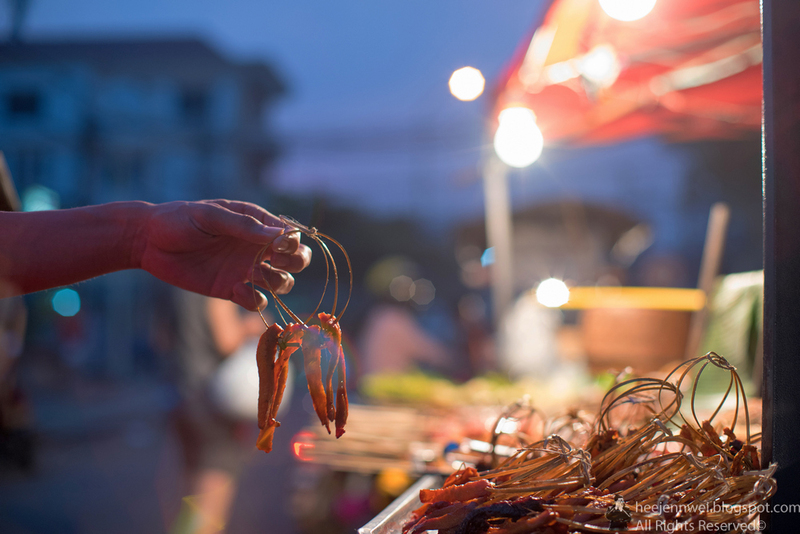 A must try local delicacy- Barbecue Cuttlefish! 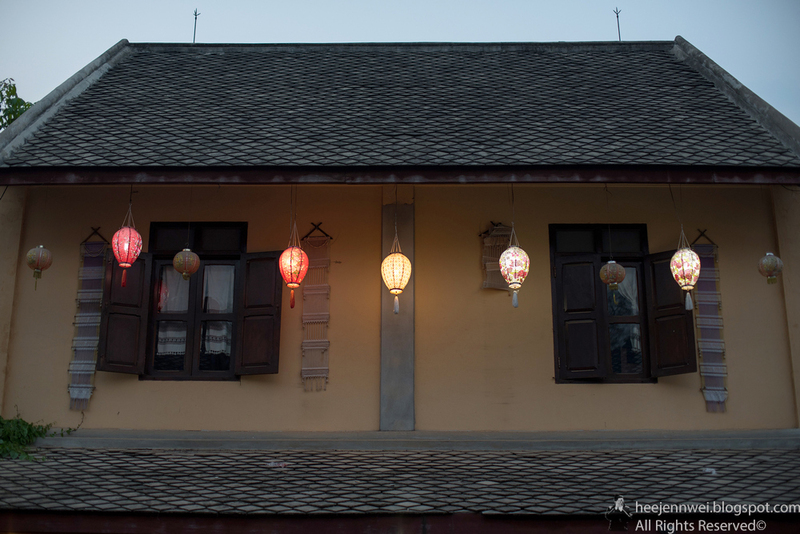 We spend our last night exploring Vientiane's night. 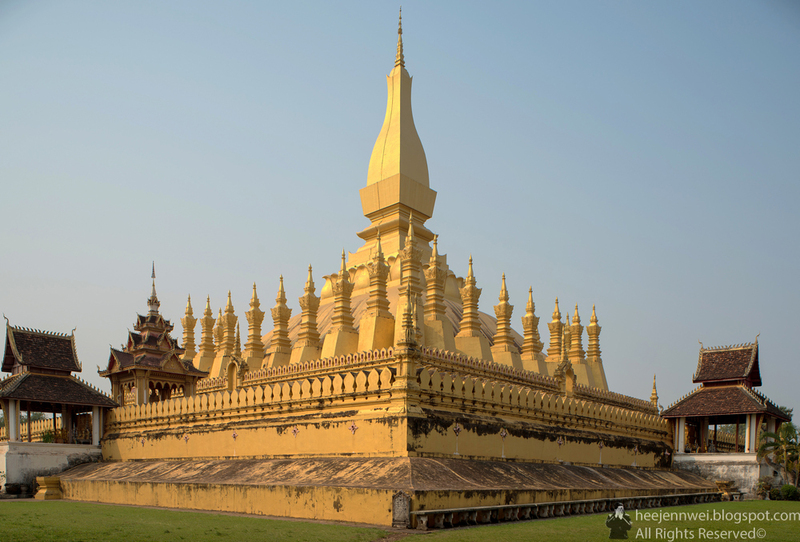 Laos is one of the most breathtakingly beautiful countries i've been to, our 5 days were magical, If you are still lukewarm on a Laos' trip, i say go! 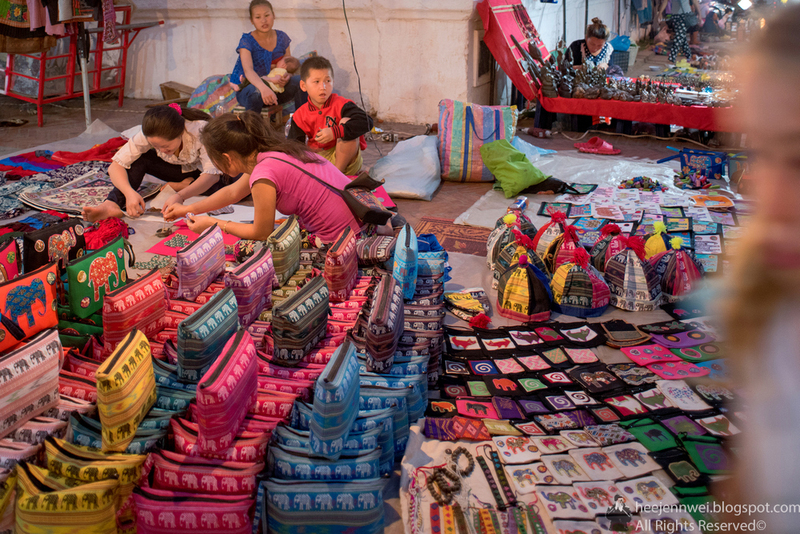 Go for sure, before it changes, becomes a "Disneyfication" of Laos. Here's to our 3rd Annual Trip! HIGH FIVE, LAOS! FOR BEING PRETTY DAMN AWESOME! Equipped with GoPro and home made selfie pole, here a travel 360 degree panorama wanderlust.